The river birch is a beautiful choice for a landscape tree. The red peeling bark and multiple trunks will serve as a focal point in the garden. This species is designated as Betula nigra and it is in the Betulaceae family with the other birch trees. 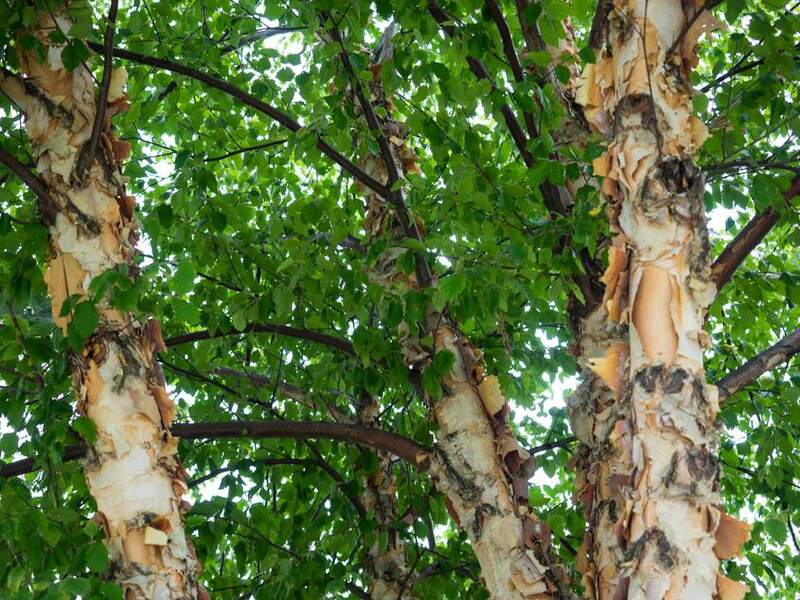 You may see this plant called river birch, red birch, water birch or black birch. The best areas to site these species are in Zones 4 to 9. The river birch grows 40' to 70' tall and 40' to 60' wide, with an oval shape. Full sun to part shade is best for growing this species. The medium-to-dark green leaves are white on the back. They are 1" to 3" long and are shaped like an oval with serrated edges. The river birch is monoecious and bears male and female flower clusters called catkins on the same tree. They form at different times; the male catkins form in fall and bloom in the spring, when the female catkins appear. After pollination, clusters of winged fruit that are small and brown form in the spring. This is an excellent choice as a specimen tree. The red peeling bark will provide color throughout all of the seasons. Plant in a location where the soil is shady, moist and has good drainage. The soil should have a pH between 5.0 to 6.5 for best results. Iron chlorosis may affect the tree if it is not within this range. Adding mulch will help keep the soil cool, which will protect the roots from drying out. Do not place mulch where it will touch the trunk. Fertilizer is only needed if the tree shows signs of distress. Water deeply for 2 to 3 hours once a week to keep the soil around the tree moist. Do not prune the river birch between May 1st and August 1st, as this is the time period when the bronze birch borers are out in full force. Leave at least 75% of the tree intact with pruning at any other times. As with most birches, the river birch may fall prey to the birch leafminer (Fenusa pusilla). This tree is more resistant to the bronze birch borer (Agrilus anxius) than other birch species. Birch dieback, anthracnose leaf blight (Gloeosporium betularum) and Christmas mistletoe (Phoradendron serotinum) can also be a problem.